Last night I went out on a first date. We met online and only met in person last night, but it felt like we’ve known each other for months. We talked for hours, shared food, laughed a lot. Dinner was so fun, and I’m glad I chose the perfect restaurant. I wanted a place with a comfy, cool, laid-back vibe – but not so laid back that it’s sloppy, and not so chic that it’s intimidating. So I suggested one of my very favorite places in Harvard Square, Russell House Tavern. I go here pretty regularly, it’s a good spot for after-work or after-class drinks, a good date night place or casual dinner, and I even spent New Year’s Eve here with Beth the Sailing Foodie and some other close friends (which was supremely fun, by the way). I really like the food and the cocktails bar scene, and everyone here just seems so… friendly. Plus I tweeted about it so if my date turns out to be pyscho and kills me (hi, Craiglist killer) it’ll be easy to track me down. Russell House Tavern is headed by Executive Chef Michael Scelfo and offers local, seasonal American food. It’s a gastropub, straddling the burger-or-pork-belly line between bar and restaurant, casual and high end, classic and modern. And while it fulfills all those labels, to me it is a classic neighborhood bistro – with its warm lighting, convenient location (literally just steps away from the Harvard Square T stop), and plenty of small plates and creative items conducive to sharing. 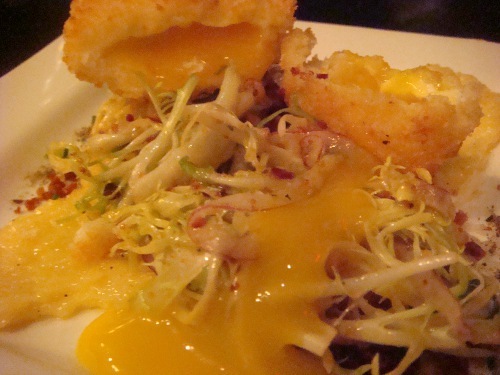 My number one go-to item on the menu is the Crispy Soft Poached Chip-In Farm Egg. 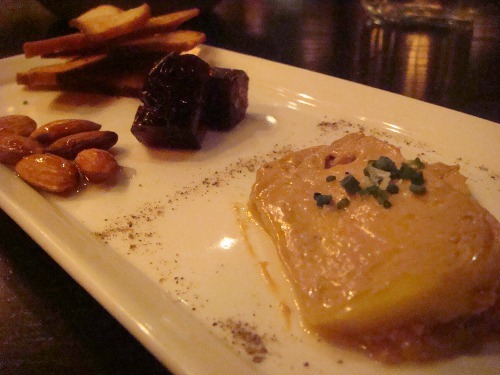 (That, and the Torched Tuna appetizer, and I’ll call it a night.) If you will only learn one thing from this blog post, please remember this egg dish. Poached egg, crispy coating (not sure how they do it, maybe magic? ), on top of a toasted brioche square and slivers of salad greens and onion, with house made pancetta and pecorino aioli. Yes, oh yes. Did I really just use the word “magic” twice to describe a poached egg? There’s something about the soft gooey yolk and its crispy exterior, and the toasted bread, salty pancetta crumbles, and the creamy, cheesy Pecorino aioli that makes me very satiated. I savor each salty bite slowly, enjoying the contrasting textures. I don’t even mind whispers of onion (I used to notoriously request “no onions” on everything but I’m slowly learning to appreciate it). It is a delightful dish, I tell you. For my entree, I ordered something I hardly ever get at any restaurant: steak frites. While I LOVE steak, I don’t eat it regularly and usually save it for special occasions, so when I do eat it, I like to splurge and go for the richest cut: the rib eye. 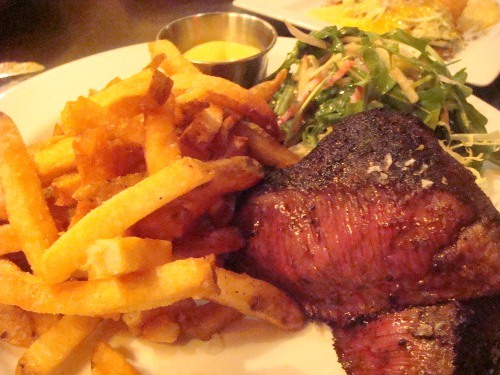 Steak frites usually don’t appeal to me because it’s a tougher cut and has a tendency to be too chewy. However last night, I really wanted something meat-y and protein-y so I decided to go for it, and requested medium rare. The flourless chocolate cake was very fudgy, and the ice cream was very cinammon-y, and after the first bite I said, “it’s very good, but I don’t taste the spice…” and then suddenly, there was a little tiny kick of spice! It was a very interesting dessert, and Rachel and I agreed that the spice flavor made us want to keep tasting it. Fudgy chocolate, then sweet cinnamon, then boom! chili kick. 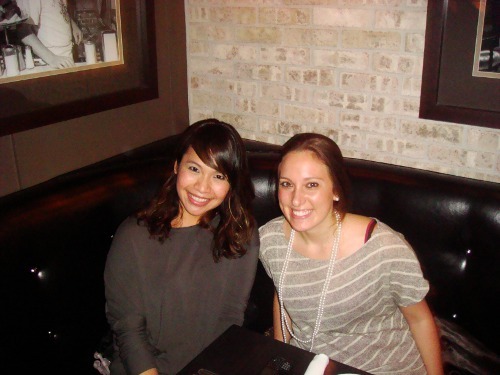 I had such a nice time last night and I’m so happy to finally meet Rachel for a dinner date*. She is as friendly and fabulous as she appears in her blog, and we had a great connection. We even talked about running a half-marathon together! 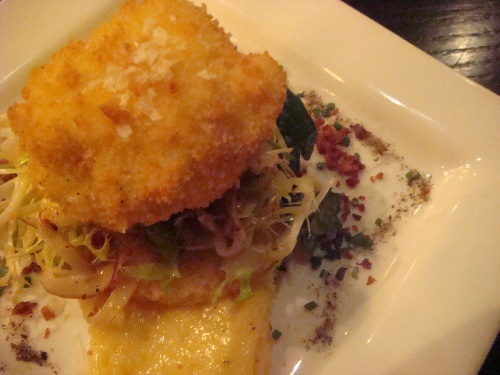 Have you been to Russell House Tavern? Do you have a regular date place? What a wonderful article, I enjoyed my first date as well hehe ; ) The pictures came out delicious-looking…and that crispy egg dish was seriously to-die-for. Great place indeed! Ha, when I started reading this, you had me thinking “She took food photos on a first date?” – and then I got it. That dessert sounds great – taste-wise, kind of like the Taza Cinnamon Chocolate Mexicano discs. But obviously smoother, since those discs are stone-ground. 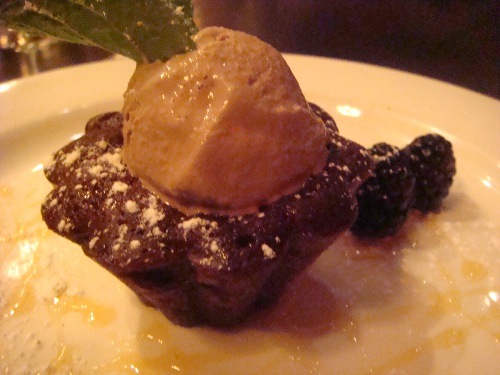 I often find flourless chocolate cakes too monotonous, so I love that RHT spiced it up (pun somewhat intended). I have yet to eat there, it’s on my list. When I first started reading this, I was wondering if your date knew you blogged… I love Russell House Taven and like you, am OBSESSED with the poached egg. Other favorites include their charcuterie plate, flatbreads and burger! Russel House Tavern is fantastic! The egg looks amazing. I need to get there stat! looks great! I’ve only been to RHT for brunch and I thought it was so-so. That poached egg does look magical, though! I might come back just for that! I love Russell House Tavern! That egg is truly amazing. We go to Les Zygomates a lot for date nights. 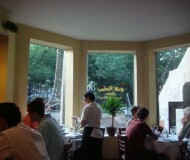 It is cozy with great jazz music and great food. You crack me up! before I learned who your date really was, I thought, impressive that she had this great connection with this dude, and she is taking pictures of food. winner. no really, rachel sounds like the perfect companion. thanks for the honest review of the dishes. I have got to try that crispy poached egg. Hehe. I love RHT for date nights (real and with friends!) I’ve never noticed the poached egg on the menu but will need to try it! I love their flatbreads, mini-crab sandwiches, burgers, you name it! Oh – and their drinks are great. Order anything fun?! Ha ha… love the way you started this post. I was immediately wondering if you told the guy you had a blog. Then when I saw you actually went ona blog date instead, I was kind of relieved for you. :) Everything sounds fantastic, especially the poached egg. I’ve been for drinks but still need to try the food. Bianca- wanted to let you know that I gave you the Stylish Blogger Award because I love your blog! Stop by the blog and check it out. I hope you’ll share 7 things with everyone! Have to agree with the other bloggers- I totally got nervous you were taking pictures on a first date!! haha nice way to open up the post!!! I love poached eggs and that steak looks delicious! 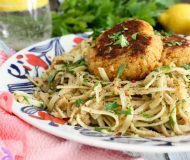 Hi Bianca – your dinner sounds yum – love Russell House! (BTW in response to your post, I don’t use protein powder in my smoothies – I don’t like the slightly medicinal taste it adds – tho perhaps I haven’t used the right kind)…. Hahahaha, you had me going, I thought you were going to really blog about a romantic date, good one! this sounds like a great date spot then…all those dishes look so lovely.. thanks for sharing this experience with us..have a nice day. I want to go to dinner all of the places you write about! I’m glad your “date” was great! I loved this post! I loved the date too! :) Great intro! PS Your crispy poached egg looks delicious! I am infatuated with Russell House Tavern. Have you ever tried their charcuterie plate? It’s TO DIE FOR. And I just tried their poached egg recently and it was absolutely amazing! I LOVE the way you started this post – so cute! Date night…. I love blogger dates, and though I have never been to Russell House Tavern I bet I would LOVE that poached egg. yum!